Frequent blog visitors may recall the previous photo sessions I have done with baby Kelly, who isn’t a baby at all any more! I had to get this shot to see how much Kelly has grown since I last photographed her. The letters spelling out Kelly’s name were made by one of my previous brides, the lovely and talented Erica, who works with Kelly’s lovely mom Erin. Such a sweet happy girl! One thing I notice about some of my favorite photographs of Kelly is how she is always checking out the world around her. Kelly is such a smart, curious little girl! And yes, totally adorable too. Thanks Erin and Mike for having me photograph Kelly – it’s always a good time! Hope to see you again when the weather warms up. ← 2010 Bride’s Choice Award Winner! These are beautiful! Such a cutie pie too!! 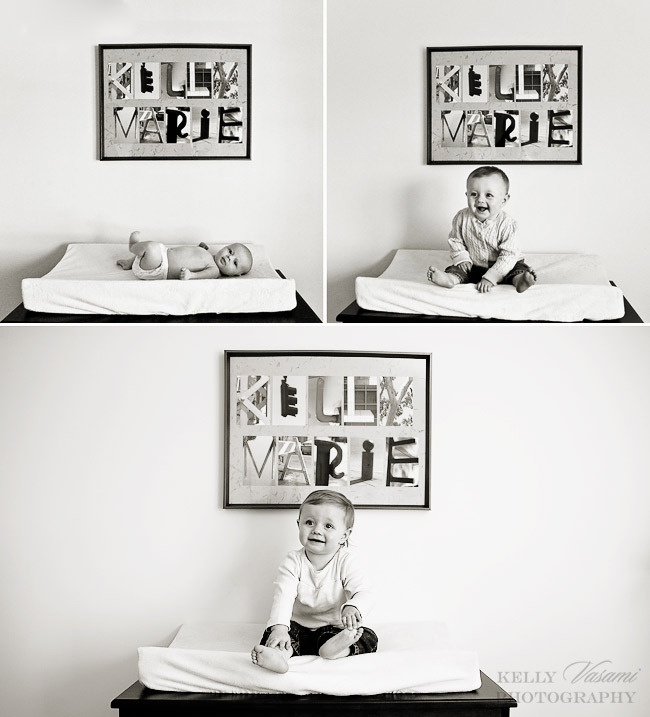 i love the photos under her name on the changing table! so sweet! !